I have enjoyed reading through C June Barnes's new book Exploring Dimensional Quilt Art so so much! (here's my review). 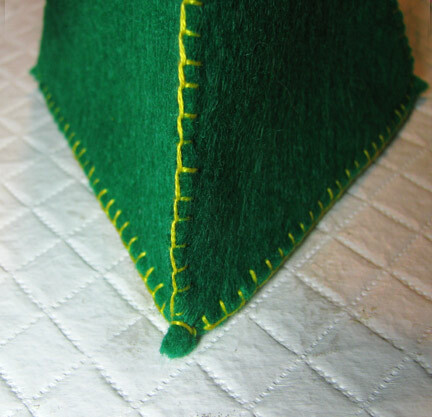 I became enamoured of several geometric shapes that she played with, but not being quite sure of my own mathematical skills, I decided to do a sample of one shape in felt rather than using fabrics that I was terribly attached to. This is not a project book, so any pieces that you want to make can only be inspired by it. Now that I've done the sample, I don't think I'd hesitate to use my own painted, embroidered, or quilted fabrics. 1. Cut out your template. 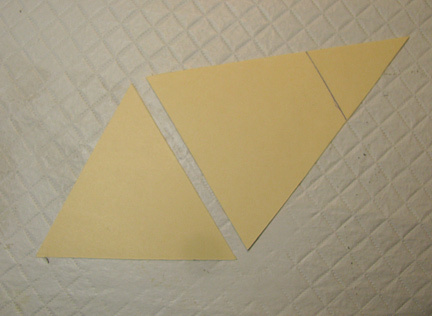 For a pyramid, cut an equilateral triangle (each angle is 60 degrees) and one side piece. 2. 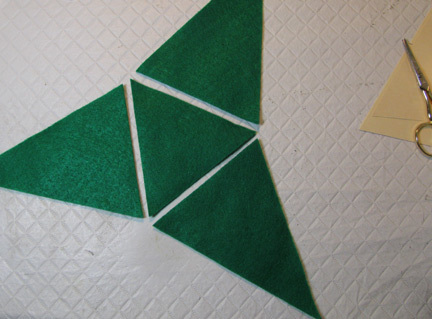 Cut out the felt pieces. Be careful and cut very accurately. 3. 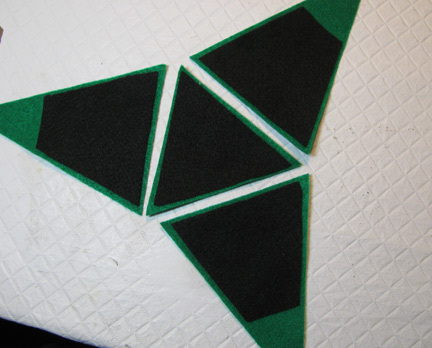 Cut out sticky-backed felt pieces that are about 1/8 inch smaller around the edges, and shorter than the sides as shown. 4. 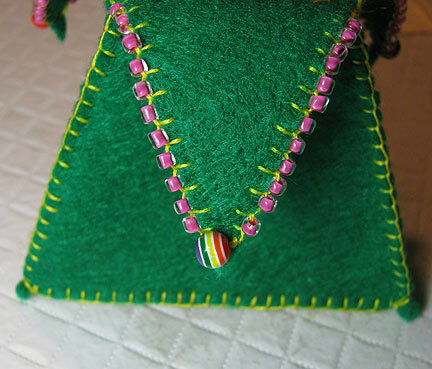 Stitch each side piece to the bottom using 2 strands of embroidery floss in a blanket stitch. 5. Stitch up each side edge and tie the bottom corners as shown. 6. Stitch around the floppy tips of each side, adding beads. I added one larger bead to help weight down the corners. 7. 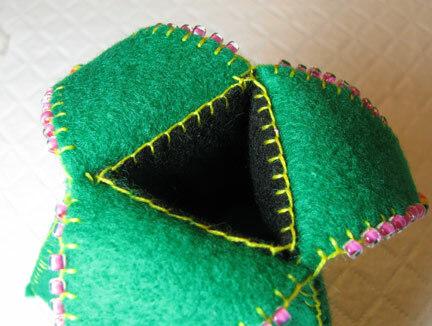 Stitch around the inner edge to keep the sticky felt from coming loose. 8. Wouldn't this be great with additional embroidery, beads, or quilted embellishment? Copyright 2012 Cyndi Lavin. All rights reserved. Not to be reprinted, resold, or redistributed for profit. May be printed out for personal use or distributed electronically provided that entire file, including this notice, remains intact. Wouldnt they be cute in xmas colours, strung off a banner with little goodies in them as an advent too! Thats great! 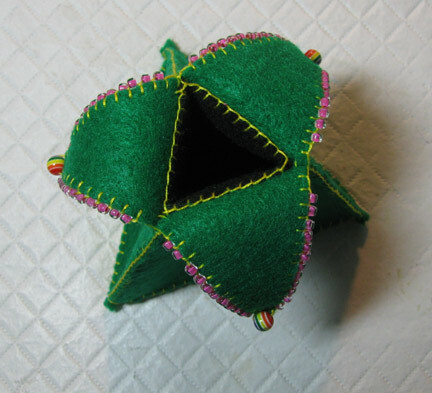 I have seen quite a few quilting pieces that would adapt to felt very easily if you want to do a trial run. 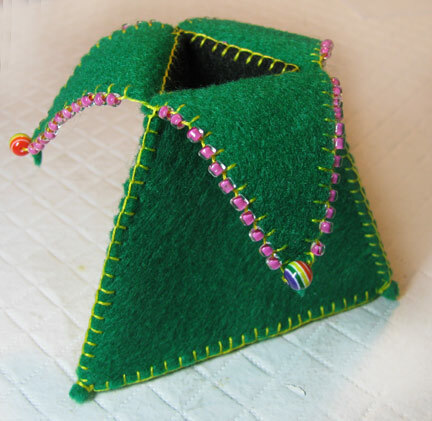 Check out some of the free pattern downloads on Quilting Daily; there are lots of little boxes and purses just waiting to be played with/embellished! And felt is so forgiving too! I was thinking about maybe trying this reverse applique technique for the next one. Whaddaya think? Fabulous! That will be great fun to do, so many alternatives! I look forward to see what you do with this! Ohhh, I can see so many uses for this! I am so giving it a try! It's absolutely elfin! I love it, Cyndi.